Jason Cage is sequestered away in a monastery in the mountains of India. His exile is self-inflicted, as Jason is not like other people. The sole survivor of a horrible accident that left him orphaned and alone, Jason was adopted and grew up knowing he was different from all others. After a series of strange nightmares involving an old friend, Jason comes out of hiding to travel across the world. He has twenty-four hours to save the only woman he has ever loved, but elements are at work to ensure that he fails. 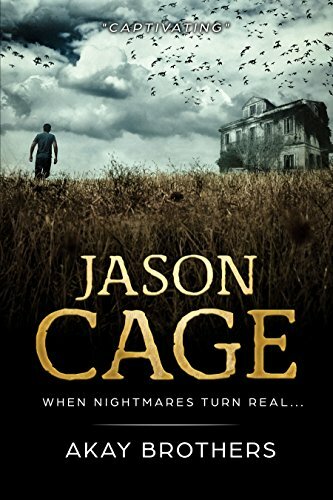 Jason Cage is the first book in the series of the same name by the Akay Brothers. Hailing from India, the duo has created a tale that is somewhere between Donnie Darko and Constantine, although I did catch a bit of a Penny Dreadful feel as well in a few of the flashback bits. Jason’s gift, or curse, is that the people he dreams about are either dead or are soon to die. For this reason, he has fled to the peaceful mountains and the monastery, but he knows he can’t sit still when the subject of his dream is his college crush, Lisa. Jason sets out with Don, a strange companion to say the least, to rescue his one-time love but as he is hunting an unknown evil he is also being pursued. This was one weird book. With many flashbacks, subplots, and twists it was at times challenging to keep up and often felt like I was reading several different books in one. Each subplot throughout the various timelines was used to tell a broader piece of the story and after a while, they started to work together to give the reader a vision of the depth of the evil that is pursuing Jason. With this being the first book in a series that will span several books, the ending is a bit of a cliffhanger and leaves Jason’s fate and future open. Quirks aside and viewing this as the story that “sets the stage” for any future books in this series the Jason character is one that I would like to see more of.